It would be easy for me to point out one particular moose hunting rifle and then point out all its strong points. The truth be known though a strong case can be made for dozens of different calibers. I have used two commonly available calibers myself and have had very good success with both. I will explain that later. 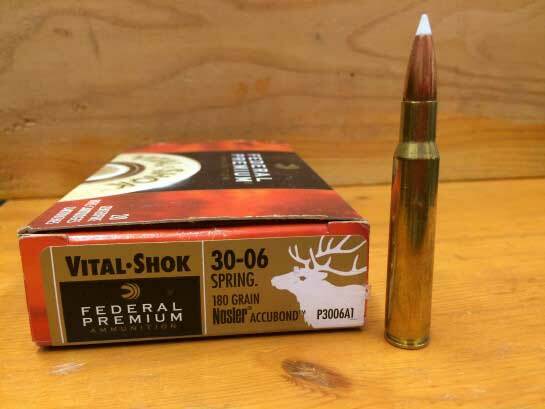 As you may be aware the topic for choosing a rifle caliber for big game hunting has been hotly debated since before smokeless powder was available. Hunters are passionate people and are usually more than willing to sit down and share with you there choice of calibers and why they think their choice is best... or at least better than yours! What Makes the Best Moose Hunting Rifle? Moose are huge animals, therefore whatever moose hunting rifle caliber you use must have at minimum enough energy to penetrate the vitals on a broadside shot (that would include breaking a rib or two). If you are not prepared to wait for a broadside shot only, then you will need enough energy to pierce the thick shoulder bones and still reach the vital area. The best moose hunting rifle should be capable of either of those scenarios. As hunters, the one thing we must all keep in mind it is our duty to dispatch our game quickly and humanely. I find it necessary to discount a few so-called candidates for a moose rifle. It would be frowned upon by the big game hunting community for you to be hunting moose with any 22 caliber rifle, they are just too small and do not carry enough energy, I would go so far to suggest that a 243 caliber rifle is too small for hunting moose as well. 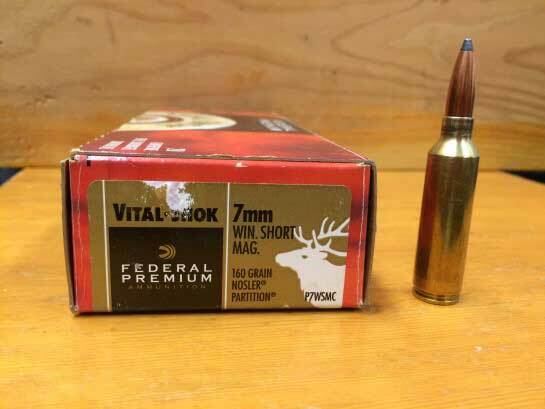 These small calibers just do not have enough bullet mass or energy to take down moose sized game. 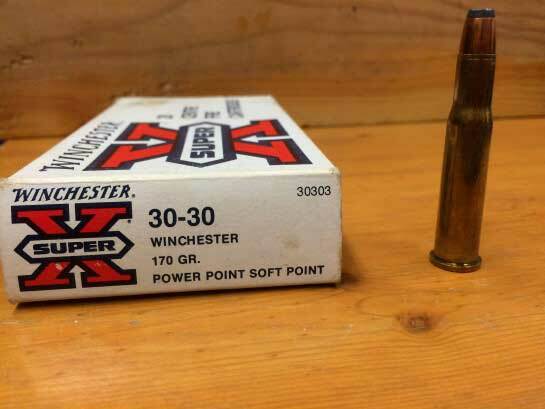 Who has not heard of the venerable 30-30 Winchester? This caliber has probably killed more game (including moose) than any other firearm in history, but it would not be my first choice for a moose hunting rifle. 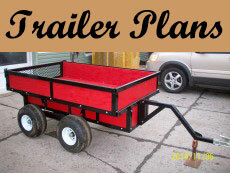 Compact and light weight they are a hunters dream except for its short comings. 1) Effective range 150 meters (yards). 2) Not enough energy at the further distance. 3) It is not an accurate cartridge. 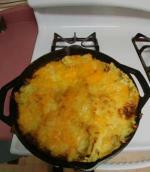 It makes a great deer sized game rifle, just a little too small or light on energy for moose. 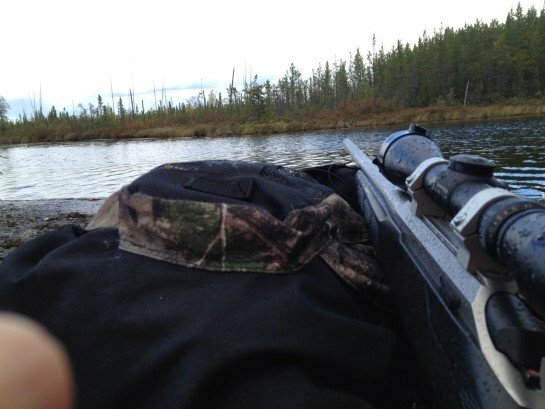 If you stick with well-known and readily available calibers for moose hunting you are on your way to success. 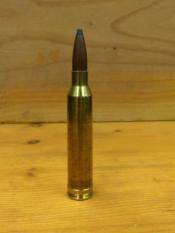 The .30-06 caliber rifle is an awesome caliber. If you are a re-loader you probably already know that bullets are available from 100 grains up to 220 grains with a huge variety of shapes and weights in between. Love the 30-06? Show it off with our antler art. 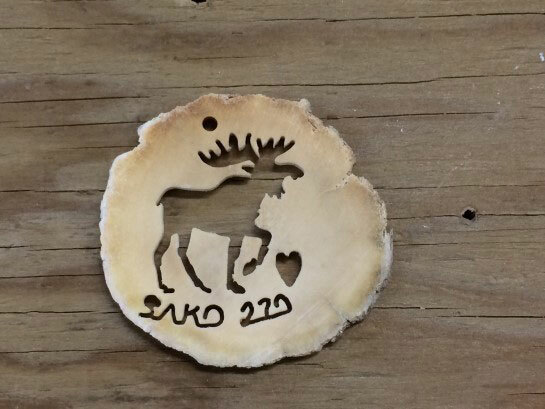 Love our antler art? Want one in your caliber? 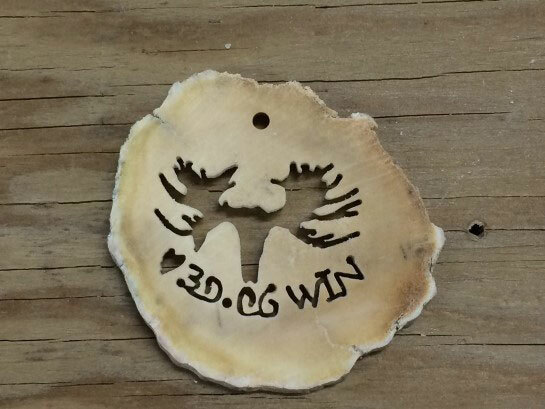 Visit our antler art web pape and order a custom one. The 30-06 has everything going for it. Loaded with 180 grain bullets, you can take on any North American Game. The .30-06 is a good flat shooting, long range moose hunting rifle. It is an accurate caliber with lots of energy; loaded correctly, has a point blank range of approximately 330 meters. 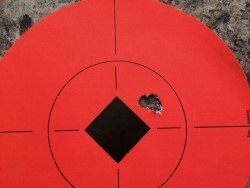 Point Blank Range: when sighted correctly will hit a 10 inch diameter circle anywhere from the muzzle out to 330 meters. This distance is more than ample for most moose hunters in any situation. Be sure to check out our recommended hunting gear page! I have taken 11 moose with my 30-06 caliber using 180 grain bullets, 8 of these moose were with one shot the other two I took one more shot, only because they were still standing (as it turned out , the second shot wasn’t required). I have been very happy with the results with this rifle and highly recommend it as an excellent moose hunting rifle. My son and my father now share the 30-06, depending on which one of them comes with me. I have a Leupold rifle scope mounted to most of my hunting rifles. This is the brand that fits my budget and gives me the reliability and quality I expect. In search of the perfect hunting rifle. Blogger Adrian Skok talks about building the perfect North American rifle and how some calibers, ones we wouldn't think of using, will take down the largest of game. Skok says: There is much wisdom in the statement, "beware of the man with only one rifle, because he likely knows how to use it." 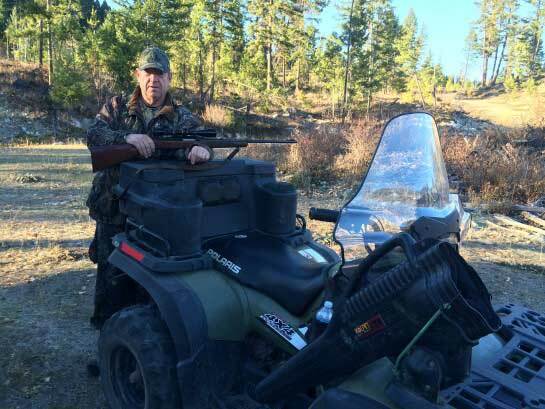 My father has always loved the .308 cartridge for hunting moose, but through an unfortunate turn of events lost it. In his younger days (he is 90 now... and still moose hunting!) he hunted moose on horseback in the Caribou region of British Columbia. He had a Savage model 99F in .308 and killed several moose with it using 150 grain bullets. His recommendation... the .308 caliber for a moose hunting rifle. I must agree with him, the .308 is a good cartridge for moose hunting. 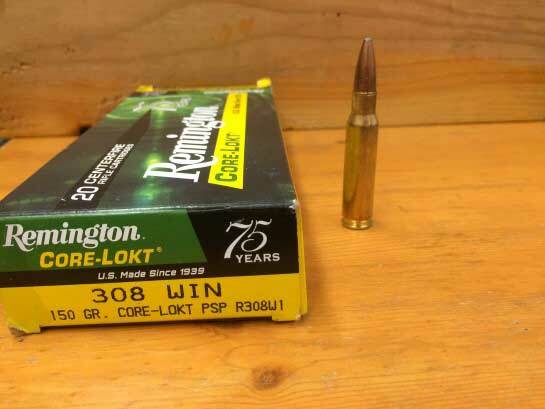 For me though I look for a cartridge that has just a little more reach than what the .308 has to offer. My current moose hunting rifle is a .270 caliber. Some might argue that the .270 is under gunning if used for moose hunting. In some senses they would be right... but in the right hands it is an adequate cartridge. It is another example of a flat shooting long range hunting rifle. Since switching to the .270 I have shot 9 moose. It is a .270 caliber Model-75 stainless steel with a beautiful wood stock. I use 130 grain Nosler Partion bullets. My 270 has taken lots of one-shot moose? How about you? Or are you undecided? One of my moose hunting partners shoots a Parker Hale 7mm Remington Magnum with 160 grain bullets and has taken many moose with this rifle. He loves this rifle, as a matter of fact I have several friends that use this caliber for a moose hunting rifle. My only complaint is the recoil. With the amount of recoil you get from any magnum rifle, it just does not make it a pleasure to shoot. New to me this year is the 7mm Winchester Short Magnum. The model I received is a Browning A-Bolt in stainless steel mounted in a synthetic stock. The scope is one that I love! It's a Leupold Vari X-III 3X9 with a 40mm objective. As of this writing I haven't had a chance to take it to the range nor will I be able to try it out on a moose hunt this coming season (we are going for the archery only season). I'll probably choose a solid copper bullet in either 130 or 150 grain for this rifle as I have decided to do my part for the environment and switch away from using lead bullets (see article on the banning of lead bullets). Another friend of mine shoots a 338 caliber rifle and he too, has taken many moose. It would seem that you are not alone. The question of which is the better moose hunting rifle combination for moose hunting has been going on for years. I have an opinion that will likely be in disagreement with others. You see, there is no absolute correct answer! Recommendations are about the best we can do. You need to do your research, due diligence I think we’ll call it. As I stated previously I currently am using a Model 75 Sako .270 caliber hunting rifle, and I get my moose. I also should say that I am a marksman; I have competed in and won many competitions. With my skill level I have no problem using this caliber; I also know the limitations of this moose hunting rifle. There are definitely times when I must choose to wait for a better presentation from the animal or simply choose not to shoot. How much money do you want to spend? Prices can range from a few hundred to several thousand dollars! Are you prepared to take only broadside killing shots? Or are you going to take a chance at marginal shots too? What distance you will most likely shooting at? 100 yards to 400 yards? (If you do not practice long distance you should not shoot at an animal long distance). IE: You should never shoot at an animal at any further distance than what you practice and are efficient at. Are you hunting the prairie provinces or are you hunting the thick west coast mountains? In other words do you need a long range or a bush moose hunting rifle. Do you flinch when you pull the trigger of your hunting rifle. Are you afraid of the recoil? Many a hunter get beat-up by their own rifles because they purchase one that has too much recoil for what they can tolerate; this only makes for sore shoulders and wounded animals. Do talk to everyone you know who knows anything about moose hunting. Find out what they use for a moose hunting rifle, ask questions. Go to your local rifle range and see what successful hunters are using. 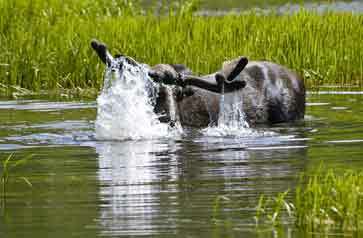 Don't forget our moose hunting tips page. It's a valuable resource! I recommend that you look at the .30-06 Winchester or the Winchester Short Magnum (WSM) in .300 caliber as possible choices for a moose hunting rifle. These rifle calibers offer a large choice in bullet weights to suit the demands of the modern day hunter. You should be able to find a cartridge that is fitting for moose sized game. For the average hunter these are high performance hunting rifle calibers that give magnum velocities without the massive recoil. Most rifle manufacturers make entry level to premium grade rifles. You should be able to find one to fit your budget. Stick with the well-known brands and calibers for a moose hunting rifle, this way parts and ammunition will be readily available no matter where you travel. Oh, I almost forgot... stay away from semi-automatic rifles, they just do not have the accuracy potential of the always reliable bolt action rifle. Want to know what scope to mount on your moose hunting rifle? I recommend the Leupold VX Rifle Scopes. A note on break action rifles: If you are not 100 percent confident in your shooting abilities I would stay away from these. If you need to make that second shot it just might take too much time to reload. The results of the vote for your favorite moose hunting rifle caliber are in constant change. As of January 2019: 1791 respondents. 30-06 (23.2%) chose as their favorite moose rifle. This list comprises the most popular, vote to see the balance. The Other category was chosen by 310 respondents. What do you think? Voice your opinion! 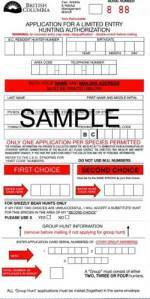 Once you purchase your moose hunting rifle....Practice, Practice, Practice. Assuming of course you have taken the time to properly sight in and maintain your rifle. I cannot stress this enough! Remember this if you remember nothing else, do not shoot at animals at any greater distance that what you practice and are proficient at. It is very disheartening to hear a hunting story of a hunter and they brag about how it took 3, 4, 5 or more shots to take a moose down. One properly placed shot, through the vitals is all it takes. Then when the moment of truth arrives, you need to decide under what circumstances you will shoot; know the anatomy of your target, identify the vital area and make your shot confidently. 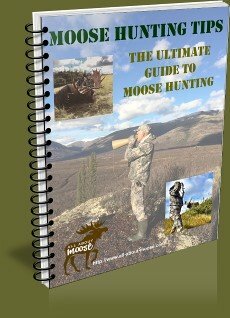 Want to know what kind of moose hunting ammunition to use? 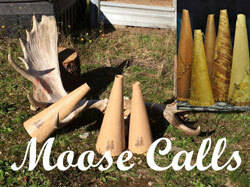 Visit our moose hunting ammunition page and read our point of view. Do you have a favourite caliber or have a question about moose hunting rifles? I think it is fair to say that most hunters have a favorite big game rifle (brand, action and caliber). Do You? Why did you choose it? Do you think that one particular brand, caliber or action is best? Why? Got a question?? Ask away! Best ammo and caliber for moose hunting in Northern Manitoba, Canada. If you selected - Other, please indicate.